The Chinese authorities have alleged that a company owned by the detained artist, Ai Weiwei, evaded a "huge amount" of tax, state media report. Police told the official Xinhua news agency that Beijing Fake Cultural Development Ltd had "intentionally destroyed accounting documents". One of China's best known artists and a vocal government critic, Mr Ai was detained at Beijing airport on 3 April. He only was allowed his first contact with his family on Sunday. The artist met his wife, Lu Qing, at an unknown location and assured her he was healthy, his sister told the BBC. Beijing Fake Cultural Development - which handles the business aspects of Mr Ai's art career - "was found to have evaded 'a huge amount' of tax' and also to have 'intentionally destroyed accounting documents'", Xinhua reported, citing unnamed police in the capital. The agency also said Mr Ai was being held "under residential surveillance", which usually means detainees are confined to their homes. Although a co-designer of Beijing's Bird's Nest Olympics stadium, he later disavowed the project, condemning China's hosting of the Games as "fake and hypocritical"
Mr Ai's sister, Gao Ge, said his family had not been officially notified of the accusations. But she said they were another unfounded effort by the police to justify his detention. "He's not the company's legally-designated representative, nor is he the chief executive. 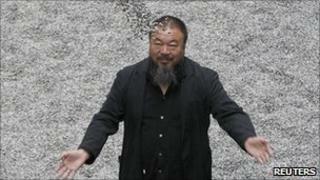 So even if the company is accused of these crimes, Ai Weiwei should not be detained," she told the Reuters news agency. "There's been no notification to us or to Lu Qing," she added. "Again, the authorities are saying one thing to Xinhua to tell the outside world, but they haven't observed any legal procedures to tell us." The manager of Beijing Fake Cultural Development, Liu Zhen'gang, and the company accountant were detained about the same time as Mr Ai and were still in custody, Ms Gao said. China's foreign ministry previously said that Mr Ai was under investigation for "economic crimes". It also insisted that his case had "nothing to do with human rights or freedom of expression".